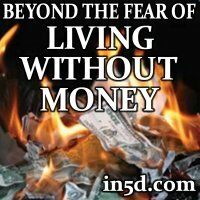 Living without money is an issue that many are concerned about but not many people are talking about solutions. Many of us already live in either poverty or near poverty levels. Is the answer found in government assistance and the material world or is it found in going beyond this ego-centered, materialistic world and finding a new way of living? The world’s economy is based on economics, which is backed by the banking system that is designed to create debt. For example, imagine that I am your local conglomerate bank and there was only $100 in existence. If I lent you that $100 and expected you to pay me back $110, how can you possibly do this when there is only $100 in existence? Where are you going to come up with that $10 extra dollars that never existed? This is the global Ponzi scheme that banksters have been playing since the inception of currency. The mainstream media continues to push ego-centered, materialistic programming while its advertisers support this mentality. In the meanwhile, we are blinded by reality as we play into the system that has entrapped us as being economic slaves to the elite. It’s a no-win situation. The rich get richer at the expense of our hard work. Is this our true, divine reason for being here? To put things in perspective, if a UFO were to land in your backyard, there are two things the extraterrestrial wouldn’t have: a bible and money. The current financial system is not backed by anything such as gold or silver, so there is not much difference between the cost of printing a $1 bill or a $100 bill because it’s just paper, yet for some strange reason, we place a high value on this paper backed by nothing. This is insane! Ask yourself this: The Roman Catholic Church has enough net worth to feed, clothe and shelter every person on this planet, so why is there starvation and homelessness? How can anyone truly feel happiness while knowing their fellow citizens are starving? How blinded are we by the main stream media? So, how can we live in abundance without money? Jacque Fresco’s Venus Project has all of the answers. Is this the reality you are creating and envisioning? The only people who NEED money are the same people who made us their economic slaves. It’s time to break those chains.